Celestron introduced their first telescope in 1964, and since then they’ve managed to acquire much of the market share around the globe. Known as the first major manufacturer of Schmidt-Cassegrain telescopes, they’ve become well-known for innovating products that have helped shape the entire industry. Astronomy has become one of the oldest past-times, and through the years we’ve seen huge transformations as technology continually reshapes the premise of a telescope. Most Celestron telescopes feature GoTo which uses this upgraded technology to automatically find celestial objects based on their computerized location. Most models can interface with a computer or laptop through a USB connection which allow them to be externally controlled. GPS receivers are also being integrated into most Celestron models which allow the user to program location and time which makes it easy locate and point with superior accuracy. For this and many more reasons, Celestron has become a premiere manufacturer of telescopes which leads us into our next review. The following details the Top 10 Celestron Telescopes of 2018 and details the most notable features of each. Hands-down the top rated Celestron telescope this year is the CPC 1100 Star Bright XLT which is a Schmidt-Cassegrain model which features a focal length of 2800mm. The whopping power of this scope gives you the ability to see far off distance with superior clarity giving users the best astrological viewing experience. The class that goes into this scope makes it highly recommended for more experienced users and those who truly appreciate astronomy. The Celestron CPC 1100 StarBright XLT receives a near-perfect rating from consumers and stands out due to its dynamic features. Available in three different models giving users differing price points an 800, 925 and 1100 model. Highlight features include a dual fork arm altazimuth mount that’s fully computerized, GPS alignment, NexStar computer technology which has been proven to be the best in its class, and a 280mm aperture. Another high-quality telescope from Celestron is the CPC 925 Star Bright XLT which claims the 2nd spot in this review sporting a 2350 focal length and 9.25-inch diffraction. This Schmidt-Cassegrain model has become a top-seller on Amazon and is best suited for intermediates and professional users. Highlighted by a unique, ergonomic design which makes it simple to move from location to location which is perfect for the astronomer on the go. The Celestron CPC 925 boasts a premium price tag, but gives you a whole lot of telescope for the money. Features Celestron’s own NexStar computer controlled technology which makes tracking, locating and viewing anything in the sky a breeze. Included is a hand controlled remote control and a dual fork arm altazimuth mount which is computerized. A step down from the one above, the CPC 800 XLT is perfect for all users as it’s simple to use, but feature rich making it highly recommended for more experienced users. Complete with tube and tripod, the 3rd option in this review scores an impressive 9.2 out of 10 and is backed by all-positive consumer reviews on Amazon. The CPC 800 XLT is a fully computerized telescope which makes viewing simple while giving you superior clarity and imagery. The durable aluminum tube construction will give you years of regular use and takes full advantage of Celestron’s own technology including Starbright optical system, SkyAlign for automatic alignment, and boasts a 2032mm focal length. For beginners and intermediates, Celestron introduced the NexStar 102 XLT which is an affordable model which gives you four models to choose from. The 102 SLT features well-over 200 all positive Amazon consumer reviews and is highlighted by a short tube refractor which is made from the highest quality materials. The NexStar 102 XLT is a fully computerized refractor telescope which features a StarPointer finderscope which makes it simple to locate and align with both celestial and terrestrial viewing. Celestron’s SkyAlign technology makes it simple to align with any three objects which makes for a simple, quick alignment process. The large database features over 4000 celestial objects pre-programmed, perfect for any aspiring astronomer. If you’re looking to truly stand-out, this brass telescope from Celestron will do just that. The 22303 Ambasador is highlighted by amazing visuals giving you a sophisticated look which takes full advantage of Celestron’s upgraded astrological technology. Complete with a modern and stylish look thanks to the brass and mahogany finish, it’ll soon become the focal point of any home or office setting. The Celestron 22303 Ambassador 50 is also available in a smaller tabletop and 80 aperture model giving you three models to choose from. Other features include a cradle altazimuth mount, objective 50mm lens, 15-45x zoom fixed brass eyepiece and weighs in at under 13 pounds. The lightweight, sophisticated design makes it highly regarded by those looking for a great balance of aesthetics and performance. Another great Celestron telescope perfect for beginners and intermediates is the Astro Master 102AZ which is a blue refractor model scoring an impressive 8.6 out of 10. This affordable option gives you everything you need for both celestial and terrestrial viewing while giving you great clarity with all-glass coated optics. 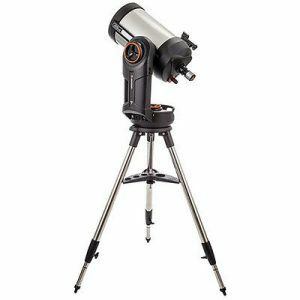 Voted as one of the best beginner telescopes, the Celestron Astro Master 102AZ stands out with a rugged pre-assembled tripod which is extremely sturdy and durable. The Altazimuth mount does a great job with performance and makes tracking and pointing out objects easier than ever. One of the most budget friendly telescope in this review is the Cosmos 60AZ which comes in well under $100. The perfect beginner Celestron telescope which gives you simplicity and ease of use and features the special edition COSMOS eye nebula graphics on the tube. The achromatic glass lenses which is fully coated gives you a clear image and is recommended for terrestrial and astrological use. The COSMOS 60AZ is not recommended for professional use, but highly recommended for those just starting out. The no-tool setup is quick and easy and can be deployed in seconds. On top, there’s a finderscope along with a durable tripod with steel legs. Other features include a Alt-Azimuth control with a panhandle and clutch, red dot finderscope, two Kellner eyepieces, planetarium app that’s free, and a mirror star diagonal. Another high-quality Celestron telescope is the NexStar Evolution 8 which is a Schmidt-Cassegrain model which is wi-fi enabled. This scope gives you the best of all worlds as the advancements in technology allow you to connect and controls via your smartphone, laptop or tablet for simple viewing, storing and optimized controls. The NexStar Evolution is best suited for intermediates and professional use and will give you years of regular use. Out of the box, you can take full advantage of terrestrial and celestial viewing with its 480x max magnification, 7.99-inch aperture, stainless-steel tripod, Altazimuth Mount with a single fork arm, focal length of 1500mm, f/10 focal ratio, and rechargeable battery giving you 10 hours of continuous run time. One of the best-selling Celestron telescopes of all-time claims the 9th spot in this review and scores an 8.4 out of 10. The AstroMaster 70EQ has become a fan-favorite for beginners and grows with you when you gain more experience with astronomy. This refractor telescope is not only affordable, but gives you dynamic specs including a 70mm aperture, 900mm focal length and 13 focal ratio. The AstroMaster 70EQ is the perfect scope if you’re a beginner or intermediate and is highlighted by a with a finderscope with a built-in finderscope. The star diagonal comes in at 1.25-inches and boasts a cg-2 equatorial mount with a 11.7 magnitude. At this price you won’t go wrong, and the best part is, it was built to last. Rounding out this review is the Celestron PowerSeeker 70EQ which is another budget-friendly refractor telescope highly regarded for beginners and intermediates. The ease of use and simplicity gives you four models to choose from each with different price points including a 60, 70, 80 and more powerful 114mm model. The PowerSeeker series has become one of the best-selling from Celestron as it offers a wide range with surprising good optics considering the price. Included out of the box is a correct image diagonal, 1.25-inch erect image star diagonal, 3x Barlow lens, German equatorial mount, 5 x 24 finderscope, 1/2: 35x/175x magnification eyepiece, 70mm aperture, and focal length of 700mm. Be sure to drop us a comment below adding to the discussion and if you have any more questions regarding this review of the top Celestron telescopes this year, don’t be afraid to ask.